These are the seven defining characteristics of SOLOTEX® that derive from the unique molecular structure of the fiber. The molecules form a flexible spring-like helix that makes the fiber soft, light, stretchy, and shape-stable. SOLOTEX® can be used for clothing or in a wide range of materials, offering limitless possibilities because of its structure. The standard series of SOLOTEX® multifilament yarns. A high thread count type with specially enhanced soft texture is also available. 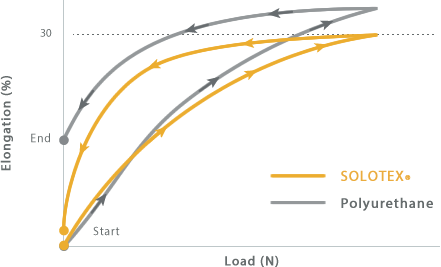 The SOLOTEX® staple fiber series. 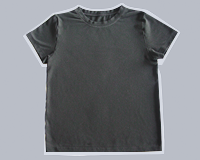 Also available as non-clothing material in the form of nonwoven fabrics, cushioning material, and filling. The high-stretch series of SOLOTEX® multifilament yarns. Soft texture and superb shape recovery. A high-power stretch hybrid that combines SOLOTEX® with ROICA® from Asahi Kasei. Super soft feel and smoothness for comfort. The moment you touch it, you understand the softness of SOLOTEX®. It feels even softer than luxury cashmere wool. 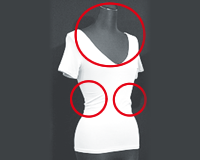 Smooth against the skin, it is more comfortable to wear than any fiber that has come before. Blending with other fibers does not affect its superb softness, while maintaining the beneficial qualities of the blended fibers. Keeps its shape to look great. 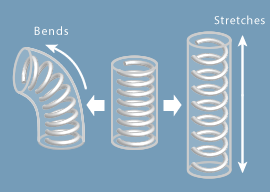 A spring-like, helical molecular structure provides form stability to “spring” back into shape even with movement. The fiber resists wrinkles and does not easily get stretched out from repeated bending at the knee or elbow, maintaining a beautiful shape at all times. There is also little shrinkage or stretch even after repeated machine washings and tumble drying, demonstrating superb dimensional stability. Resists wrinkles and does not become stretched out at the knees or elbows. Excellent form setting, with stability to resist deformation when washed. 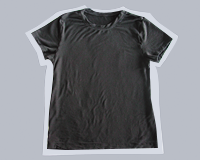 SOLOTEX® is a stretchy material, yet resists deformation due to machine washing or tumble drying. Always feels great to wear. SOLOTEX® is surprisingly free of any feeling of pressure, even following the lines of the body. It expands and contracts in any direction with the body’s movement, feeling truly comfortable and allowing for free movement. 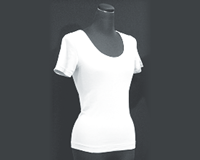 SOLOTEX® is ideal for tight-fitting bottom wear and active clothing. Harmonizes well with other fibers for even greater potential. 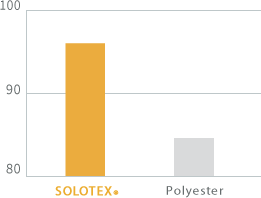 SOLOTEX® is easy to combine with other fibers. It is highly compatible with both synthetic and natural fibers, for blending as desired. The fiber will add a soft texture to improve the feel against the skin, and it provides superb stretch and recovery from elongation. It is possible to add new texture and new functionality while bringing out the characteristics of the blended fiber. The ideal cushioning with fluffy rebound. Soft and cushion-like, akin to a marshmallow. Maintains bounce even after repeated compressions and quickly recovers its fluffy volume. Because of its high durability, SOLOTEX® retains its unique texture for a long time. These characteristics are best utilized in insulated coats, pillows, futons, and other items with filling. Deep, vivid colors that last. Outstanding color development is a key element for fashion applications. SOLOTEX® is very easy to dye, producing deep, vivid colors with a high-grade feel even when processing at lower temperatures than conventional methods. Extremely colorfast for long-lasting dyed color that won’t fade. For creating striking textiles exactly as envisioned. Samples: SOLOTEX® and polyester: 84 dtex/36 filament yarn; 1 H processed yarn. Disperse dyes for each color: photos taken after dyeing at 98℃ and finishing. 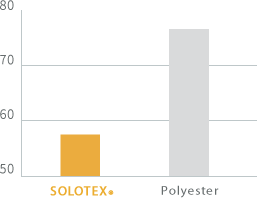 Plant-derived ingredients are used for 37% of the polymers that make up SOLOTEX®. The fabric thus reduces consumption of fossil fuels, and helps cut down on greenhouse gases. SOLOTEX® is an eco-friendly fiber that is kind to people and on the environment. 37% plant-derived. 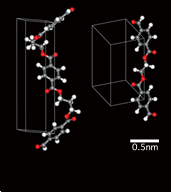 *Testing performed using radiocarbon (carbon-14) dating.